In 2017, the Dutchess County Sheriff’s Office celebrated 300 years of service to our community. 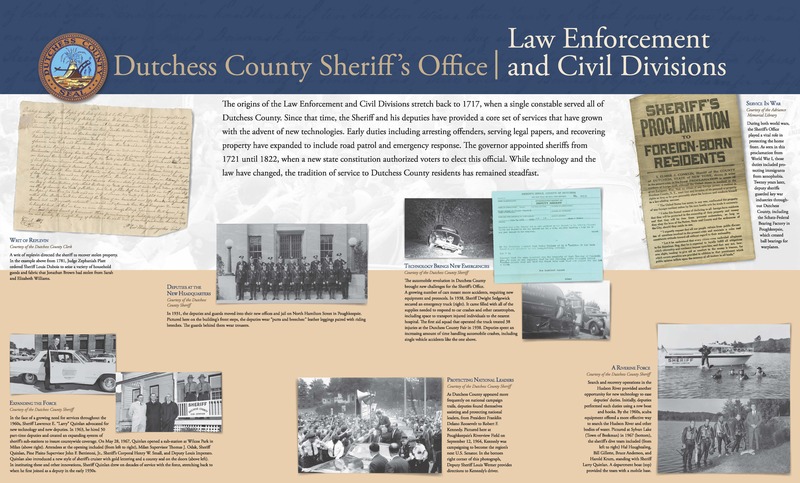 The panels below provide insights into key developments during that era for the primary divisions of the Sheriff’s Office, where the panels are on display. 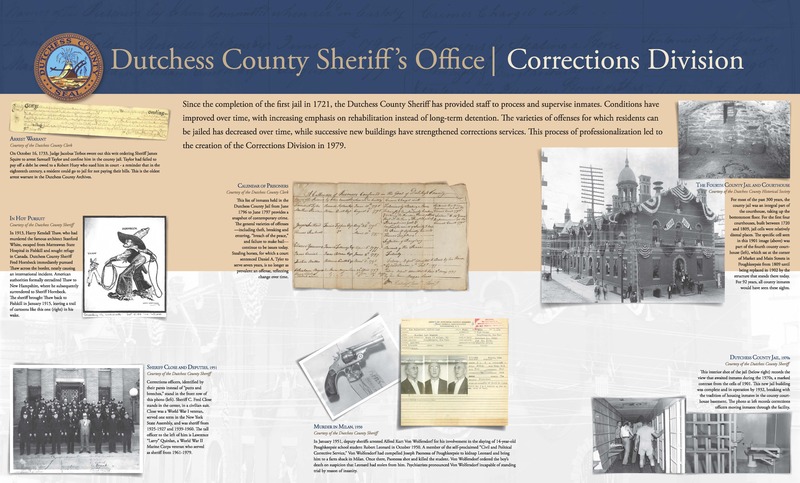 Since the completion of the first jail in 1721, the Dutchess County Sheriff has provided staff to process and supervise inmates. Conditions have improved over time, with increasing emphasis on rehabilitation instead of long-term detention. The varieties of offenses for which residents can be jailed has decreased over time, while successive new buildings have strengthened corrections services. This process of professionalization led to the creation of the Corrections Division in 1979. The origins of the Law Enforcement and Civil Divisions stretch back to 1717, when a single constable served all of Dutchess County. Since that time, the Sheriff and his deputies have provided a core set of services that have grown with the advent of new technologies. Early duties including arresting offenders, serving legal papers, and recovering property have expanded to include road patrol and emergency response. The governor appointed sheriffs from 1721 until 1822, when a new state constitution authorized voters to elect this official. While technology and the law have changed, the tradition of service to Dutchess County residents has remained steadfast.